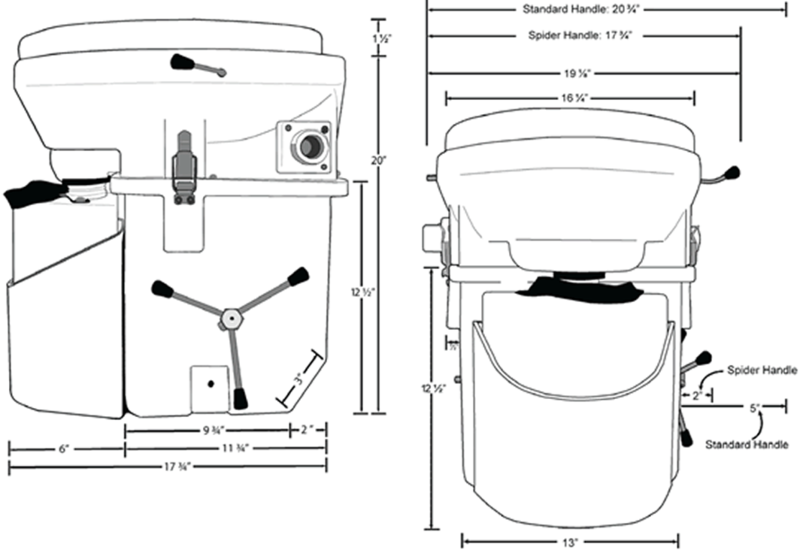 Channel Cutter Yachts is a distributor for the Nature’s Head® composting toilet. 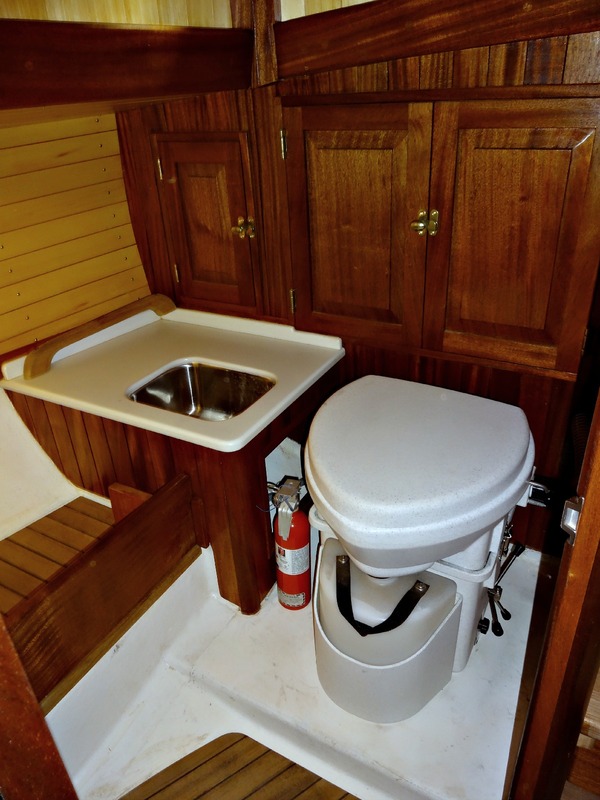 I have installed and used all types of marine heads and holding tanks systems during my 30+ years of building boats and cruising. I am convinced that the Nature’s Head is the best solution to the difficult problem of human waste aboard a boat. It is drastically better than carrying around a tank of raw sewage and looking for pumpout stations or a legal dumping site. When you add up the cost of a good quality marine toilet, with a holding tank, valves, thru hulls etc. it will often cost much more than a Nature’s Head. The key to the Nature’s Head is the urine separating design. It is very simple. 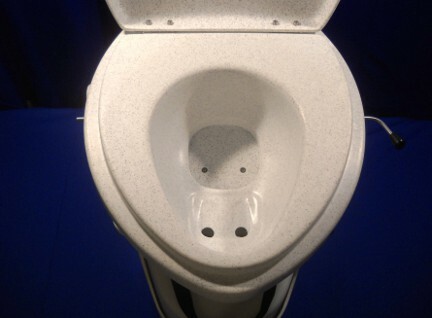 When men and women sit on the toilet, urine naturally flows forward, down the two drain holes shown. When the trap door is closed, all urine entering the bowl will flow into the urine drain. Sitting is recommended, especially underway. The Nature’s Head will hold 60-80 solid uses. This means that two people living aboard full time will empty once a month or so. 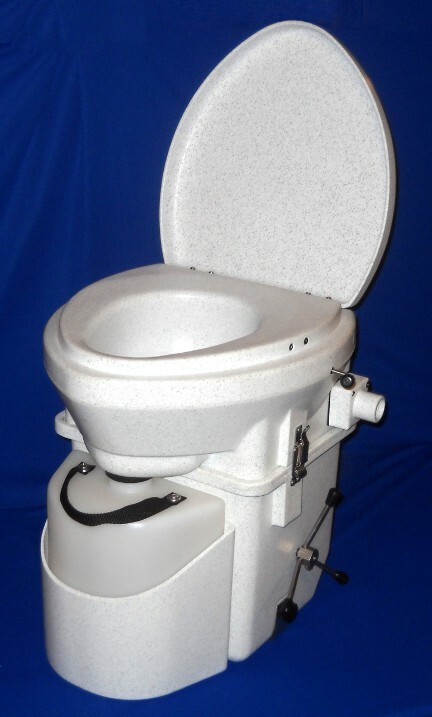 Here you can see the vent hose connection on the side of the toilet. This can be switched to either side of the toilet for convenient installation. The other side has an air intake. 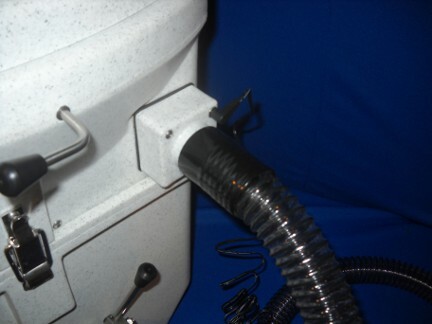 Air is constantly being drawn into the toilet and exhausted outside, with the aid of a small 12 volt fan (it draws 0.07 of an amp, which is less than 1 watt at 12 volts. It will use 1.7 amp hours of battery capacity every 24 hours). Power free installations are possible with the optional solar vent. Below are the measurements of The Nature’s Head (click for a larger image). 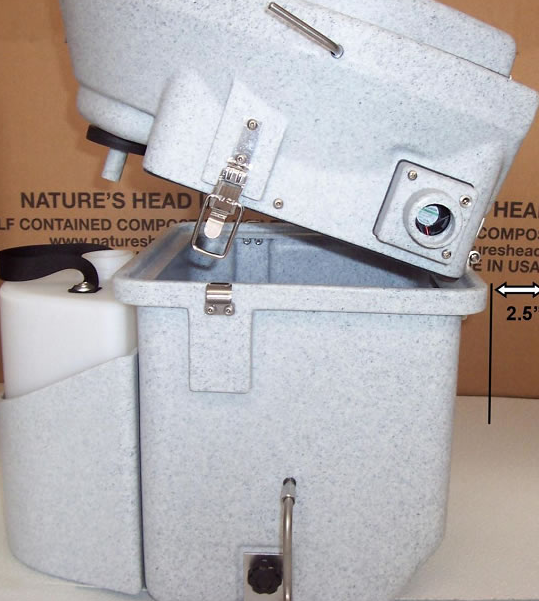 The Nature’s Head comes with a choice of two handles – the ‘spider’ handle shown at left saves 3″ of space. All hardware is marine grade stainless steel. 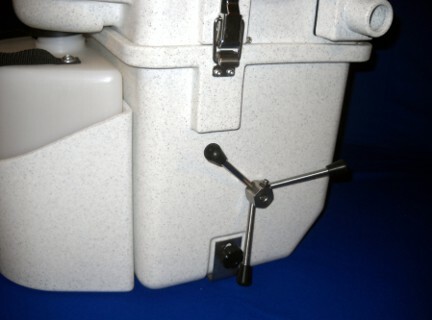 Here you can see a close up of the ‘crank’ handle. The choice is yours. Both handles work equally well, but I suggest the spider handle for installations where space is a concern. 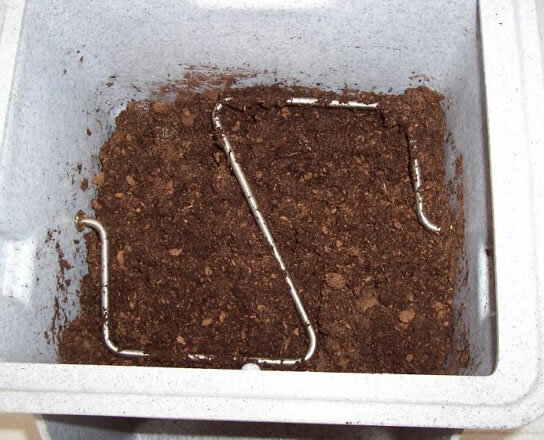 Peat moss or coconut coir is added to the base only after emptying the toilet. There is no need to add peat moss or coconut coir after each use. Below you can see how the top of the Nature’s Head tilts up, to remove the urine bottle or to empty the base. 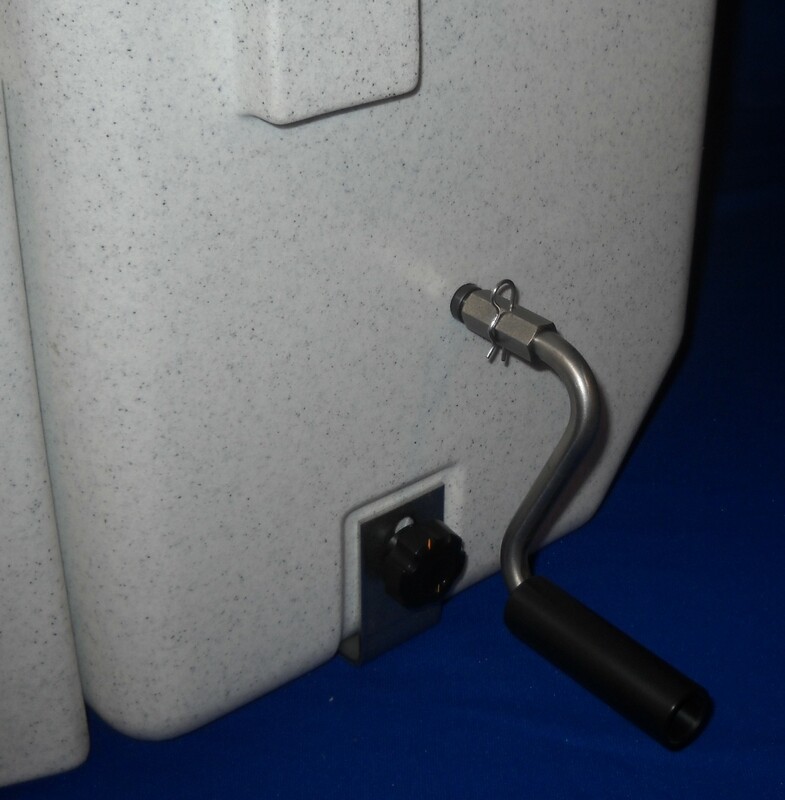 When mounting against a bulkhead or wall, you should allow 2.5″ of clearance for tilting. This means you need to allow about 20″, from the bulkhead to the front of the toilet. The urine bottle holds 2.2 US gallons. Urine is sterile and does not pose a health risk. Therefore, it is easy to dispose of either on shore or at sea. I am available should you have any questions during installation. It’s an easy job that a fairly handy person could do in a few hours, in most cases. The Nature’s Head is $925 US, plus shipping. Shipping to Canada is $98, and shipping in the US is $35. Hi. 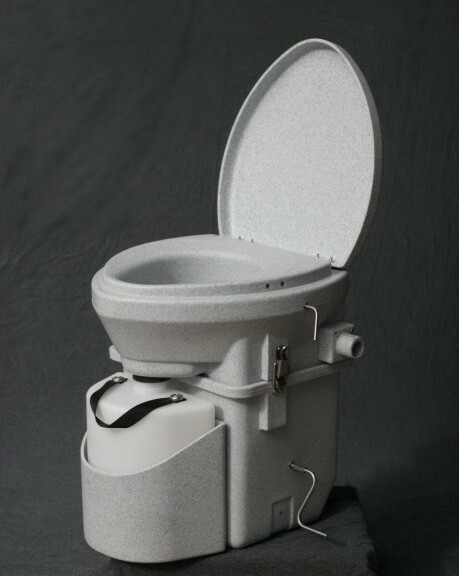 I’ve been checking out composting toilets for the container home I’m building and I like the simplicity and functionality of these units. They seem to do the trick! I live in Squamish, British Columbia, and my one concern is regarding the legality of dumping the partially composted material in the trash….like so many people seem to be doing. That doesn’t seem right to me. If I were to dump this material into my regular veggie compost that I put on my garden, how long will it take to be a “finished” compost that is safe to use…given our cooler climate here? Also, I’m wondering if you could give the exact breakdown and cost of the unit and all parts needed to get it running (in BC, / cad $). I’m thinking that the crank handle looks easier to use and space won’t be an issue for this installation. What is your opinion? Could I save a bit by ordering two? Thanks for your help! I’m looking forward to getting this project started. These are perfect for your small home. Can you give me a call please? 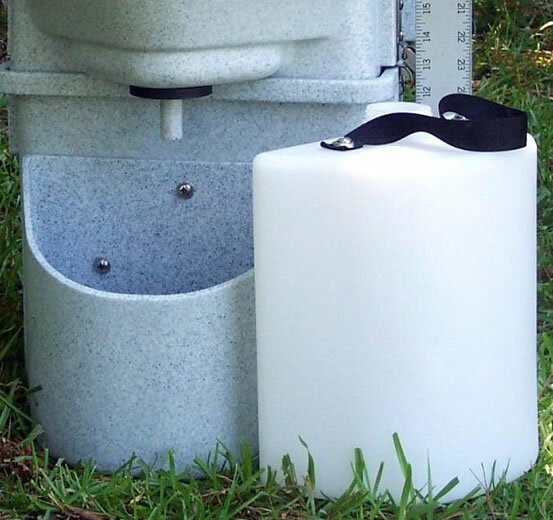 I would like to purchase a natures head composting toilet ( with the spider handle) for our small motor home, which we will be driving down through Central America. I would also like to purchase the optional solar vent. I assume payment can be made by credit card? We live in Edmonton, so I shipping should be about $90, right? Please contact at this email address. Thanks! We purchased a NH last year from you and just now are doing the instal on a Macgregor 26M. To vent,I bought a Nicro Day night Plus solar vent. 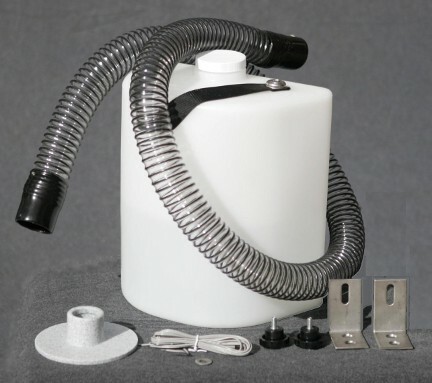 Question: as the vent hose from the NH is different diameter to the outlet hole of the Nicro vent. what would be the best way to “join” the two? The Nicro will be set on exhaust and pretty well will run 24/7 as long as there is enough sunlight and juice in the battery. Is it enough to have the outlet end of the hose in close proximity to the vent opening? Any thoughts?